Rally for HR 2003 in Oklahoma!!! Ethiopians and Allies in Oklahoma Target Office of US Senator to keep HR 2003 alive in the Senate!! Dozens of Ethiopians and American Human Rights Activists and other concerned citizens descended on the Offices of Senator James Inhofe (Republican) claiming that the Senator has placed a hold on the bill which has not yet been to the floor of the United States Senate. HR 2003 which addresses the horrible Human Rights Climate in Ethiopia and opens the door for the US to impose Economic and Military Penalties passed without opposition by voice vote last month in the House of Representatives. The bill was passed despite a lobbying effort by the Government of Meles Zenawi. Senator Inhofe was targeted for comments that he made on the floor of the Senate last month that infuriated members of the Ethiopian Diaspora residing here in the United States. 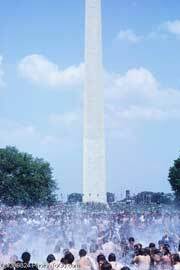 The Washington Monument a symbol of what is Great about the United States. Below is the Statement on Record by Senator Inhofe. You can make your own conclusions about what he said. "In Addis 6 years ago we found a little baby. The little Baby was 3 days old. The baby was almost dead. It was not unusual." In some Countries in Africa, they throw away mostly baby girls. Then after 3 days, when they die, the dogs get them. We were there before the dogs got there. Statement made by United States Senator James Inhofe Republican from Oklahoma On October 17,2007. At this time the Senator states that he does not have a hold on HR 2003 as it has not been reported yet by the Senate Foreign Relations Committee.